We don't think robots will be taking over the world anytime soon. Heck, they have enough trouble just walking. But, they could soon help make online shopping even more reliable by assisting Ocado's human engineers. Though we bet you anything you like they won't look like this render. Online Supermarket Ocado is set on developing a robotic army to help technicians in its warehouses with all the difficult maintenance tasks. The firm said the robots will use artificial intelligence, machine learning and advanced vision systems to “understand what human workers want and offer assistance with difficult maintenance jobs." The supermarket is working with a group of universities on a project called “SecondHands” to develop the robots. 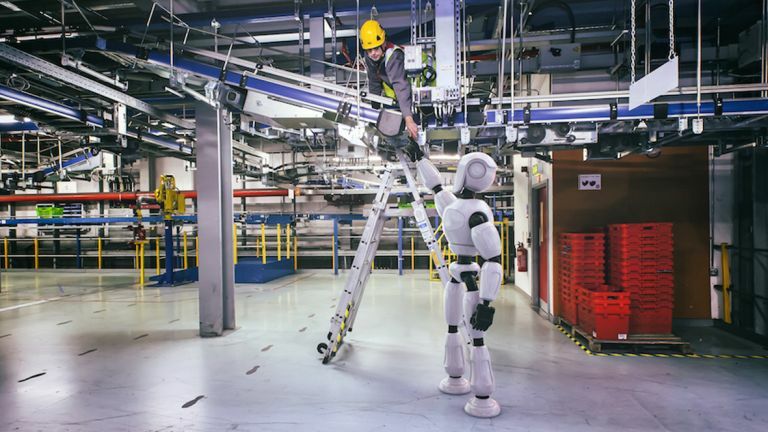 Ocado said the robots will hand tools to human maintenance technicians and manipulate objects like ladders, pneumatic cylinders and bolts, abilities which cannot be found in any current commercial 'bot. “The ultimate aim is for humans to end up relying on collaborative robots because they have become an active participant in their daily tasks,” said Dr Graham Deacon, robotics research team leader at Ocado Technology. The project is part of the European Union's Horizon 2020 Research and Innovation drive, which includes one of the worlds largest civilian robotics programmes. This project is pretty ambitious. The aim is to have robots with the cognitive and perceptive ability to understand when the operator is in need of help, understand how this help can be given, and provide relevant assistance. There is also an artificial intelligence element to this as the robots will "progressively acquire skills and knowledge needed to provide assistance. In fact, it will even anticipate the needs of the maintenance technician and execute the appropriate tasks without prompting." Researchers will also develop 3D vision systems to allow the robot to "estimate the 3D articulated pose of humans and offer support when it is needed without being asked" - ie: if the engineer is up a ladder, under a sink's U-bend, or has just been buried under a pile of spam tins, it will know. The first prototypes will go into operation at an Ocado testing facility in the coming year, with the final version working in the warehouse "by 2020".